The article below is from the Irish revolutionary group Socialist Democracy, the successor current to the original radical student-based group People’s Democracy, which played a key role in the civil rights movement in the north of Ireland in the late 1960s and early 1970s. The Socialist Workers Party, one of the two main Trotskyist organisations in Ireland, has just dissolved as a party organisation. It is now just a ‘network’ which operates through, and rather bureaucratically controls, the People Before Profit Alliance, an electoralist and non-revolutionary formation. On March 24th a meeting under the banner of “Remembering 1968: The Civil Rights Movement in Northern Ireland” was held as part of events organized by the Institute of Irish Studies. A supporter of Socialist Democracy attended under the impression that it was an academic symposium to discuss the origins of the civil rights movement. It quickly became clear that the appearance of academic neutrality was cast into doubt by the role of Socialist Workers Party/People Before Profit. A PBP councillor, Matt Collins, opened the seminar with an exposition which displayed a common fault of his organization- viewing the past through the prism of the current political line of the organization. We can take it for granted that this is the first bird of spring and that political groups from all sides will shortly be presenting their own misremembering of the civil rights struggle. In fact the first shots have been exchanged in a dispute between Sinn Fein and Bernadette McAliskey about a fictitious role for Sinn Fein in the early struggle. The SWP’s economism led to Matt portraying the revolutionary left organization People’s Democracy as resembling an early version of the Alliance Party. The presence of students from nationalist and unionist backgrounds seemed more important than their common commitment to the revolutionary overthrow of the Stormont regime. The speaker could easily have clarified things by discussing with Socialist Democracy, the successor organization of People’s Democracy. However the SWP had closed that door with a “theoretical” document claiming that the success of their electoral opportunism in the North made their organization the inheritors of People’s Democracy. Eamonn McCann could have, if he wished, corrected some of the misconceptions. However he arrived late and confined himself to anecdotes of the early days. Historian Brian Hanley added some gravitas to the day but was over-matched by other contributors with their own hobbyhorses to ride. One speaker, Ann Devlin, wanted to rehabilitate her father, Paddy Devlin, and the bankrupt Northern Ireland Labour Party. 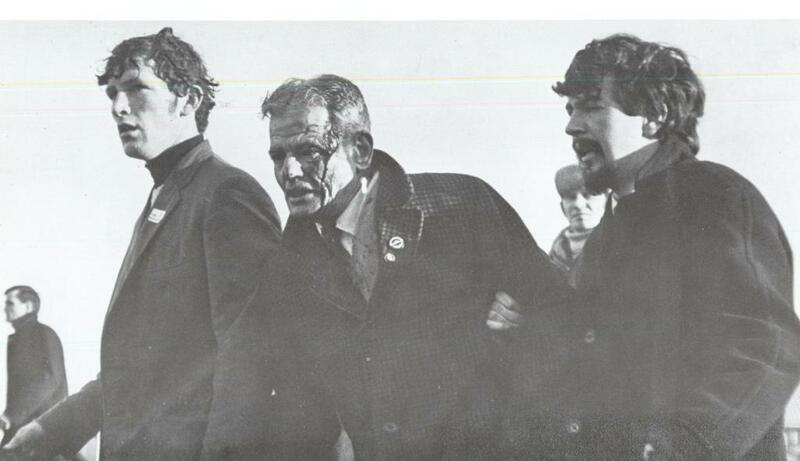 Another speaker wanted to rehabilitate the hapless Captain Terrence O’Neill, leader of the Unionists. There is a general weakness to the SWP approach to theory and history. The Marxist approach is called praxis – you apply class analysis to a situation, work out policy and then see how well analysis survives real life and amend it as necessary. The SWP work backwards – they see an opportunity, hastily work out a theory to justify the turn towards the new opportunity. If that works all is fine. If not, nothing is learnt and all is quickly forgotten. Those wondering at the SWP/SWN foray into history were not left to wonder long. A leaflet was distributed to participants inviting support for a PBP meeting: “Why we need a new Civil Rights movement” taking place on Tuesday 27th March. This meeting was addressed by Gerry Carroll of PBP, Ciarán Mac Giolla Bhéin – Conradh na Gaeilge on the language movement, Ivanka Antova – United Against Racism on migrant rights, John O’Doherty – Rainbow Project on marriage equality, Fiona McCausland – welfare rights advisor on welfare reform and Fiona Ferguson – Rally for Choice (also PBP) on abortion rights. It is notable that, despite the references to Peoples Democracy in the Queens meeting, PBP did not follow suit in PD’s insistence in including direct class questions in the focus of the meeting. A number of speakers did make clear class discrimination in areas like abortion rights and there was a link in the report on welfare rights, but the mechanism of welfare reform – the Fresh Start Agreement – was not mentioned nor the trade union leaderships acceptance of that agreement. There are a number of questions that arise immediately from drawing the mantle of the civil rights movement around you. The first is: Did the Civil Rights movement succeed? If it did, why is there a need to relaunch a Civil Rights movement? These issues arose in the discussion and it quickly became clear that both Gerry Carroll and Fiona Ferguson believed that the civil rights movement had been successful and was an early example of “people power.” The issues proposed in the meeting were proposed as elements of an incomplete democratic resolution and the organisers seemed blind to the fact that the Good Friday settlement had been based on sectarian rights rather than democratic rights, that promises of progress towards a united Ireland had proved false and that the whole undemocratic slew had collapsed. In the discussion that followed the presentations it was clear that a number of those present did not share the PBP view and saw the current northern state as the result of a failure to achieve democratic rights. There was an even more pressing issue. The main slogan of the early Peoples Democracy, and the slogan of Socialist Democracy today, was “Smash Stormont!” Would a new civil rights movement call for the dissolution of the moribund assembly? Gerry Carroll equivocated. PBP did not trust Stormont, did not know if reform would come through Stormont or not and did not think it should be restored by a rotten deal. The overall view seemed to be that people power could force Stormont to institute reforms. The discussion opened up a gap between PBP and the meeting. Some of the people on the platform and in the audience were to the left of PBP. They were not looking to the Assembly for reforms, were more conscious of the repressive role of the state and were more aware of the failures of the earlier civil rights movement. The overall impression was that most people at the meeting had now written Stormont off and were looking for something different although they were not clear on what that should be or how it would come about. While it was clear that the many campaigns would go on, it seemed unlikely that they could be united into a new civil rights movement. All the signs are that PBP have already forgotten this initiative and are now in full tilt acting as “useful idiots” for the trade union bureaucracy and “leading” disputes around leisure workers and education cuts while the trade union leadership’s silent acceptance of the Fresh Start Agreement keeps them in the background. If they took history and theory more seriously they would know that the role of useful idiot was held by the old Northern Ireland Labour Party, not by the socialists within Peoples Democracy. The above article is reblogged from the Socialist Democracy site, here. Posted on April 14, 2018, in British state repression (general), Civil rights movement, General revolutionary history, Historiography and historical texts, Irish politics today, Partition, Political education and theory, Public events - Ireland, Repression and resistance in 1970s and 1980s, Republicanism 1960s, Republicanism post-1900, Trade unions, Unionism, loyalism, sectarianism, Workers rights. Bookmark the permalink. Comments Off on Socialist Workers Network and civil rights: misremembering the past, promoting reformism today.